Turn 10 studios, creators of Forza Motorsport 4, took their recording equipment out to the race track to record the legendary 1991 Mazda 787B. Even if you aren’t a gearhead like most of us here at Torque News, you will appreciate this video. Turn 10 studios, creators of the popular Forza Motorsport 4 game, took their recording equipment out to the race track to record the loudest race car on the planet; the 1991 Mazda 787B. 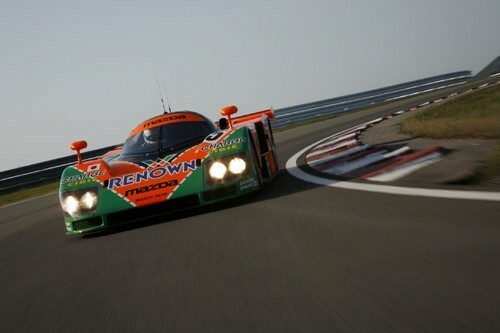 The Mazda 787B is legendary and is the only Japanese race car to win the 24-hour Le Mans, and also the only rotary-engined car to win the race. The thing that makes this car so unique is its rotary engine design. The 787B is powered by a four-rotor Wankel rotary engine, double that of the current engine found in the Mazda RX-8 sports car. The Wankel engine is a type of internal combustion engine using a rotary design to convert pressure into a spinning motion instead of using pistons that travel up and down. The very compact Wankel engine delivers incredible high-rpm’s. This is where the ear shattering sound comes from. The defining character of this car is the incredible sound of the engine as it develops over 9000 rpm’s. The car is so loud that the Turn 10 team had to use special recording equipment and protection to keep from destroying their equipment and their ear drums. So they set out to create the most authentic sound of a race car for the video game. But Turn 10 didn’t just stick a microphone near the exhaust. As you can see in the video, the car was surrounded by microphones to capture the sound from every angle. In order to create the most realistic sound, the 787B was hooked up to a dynamometer, as well as the transmission noises and exhaust crackles a driver would have experienced in actual racing conditions. As they power up the Mazda 787B engine to higher and higher rpm’s, the sound of the engine becomes loud enough to destroy someone’s ear drum. The team had to use protective sound protection to keep from losing any hearing. The previous record for the loudest recorded race car was held by the V-12 TVR Cebera Speed 12. The car used two six cylinder engines mated together to create a 7.7-liter 1000 plus horsepower monster. The car was so powerful, it broke TVR’s dyno in testing. Turn 10 had fun as they recorded the loudest race car ever. Turn up the volume on your laptop and enjoy listening to the video. So your saying that the 787b is louder than an 8,000hp top fuel dragster? I'll second Tims comment and expand a bit further. Your claiming a top fuel funny car or dragster isn't as loud? Were talking about a 10000 horsepower blown nitro methane powered 500 cubic inch hemi with straight pipes. 0 to 330 in 3.7 seconds. It sounds like the world is coming to an end when they run. Loudest mechanized noise on earth. Space shuttle is the only thing louder and a rocket doesn't really count because its basically a constant explosion. I agree! They are talking road race or formula cars...obviously! Not a contest when you start adding nitro. Anyone who has ever been in the pits at a professional drag meet would dispute this claim! Ear plugs required!